Chávez's Body Probably Won't Be On Permanent Display, New Leader Says : The Two-Way The Venezuelan president died on March 5. But his body apparently wasn't prepared in time to allow for it to be placed in such a memorial. So Chávez's corpse likely won't be on view forever — like the bodies of Vladimir Lenin, Ho Chi Minh and Mao Zedong. 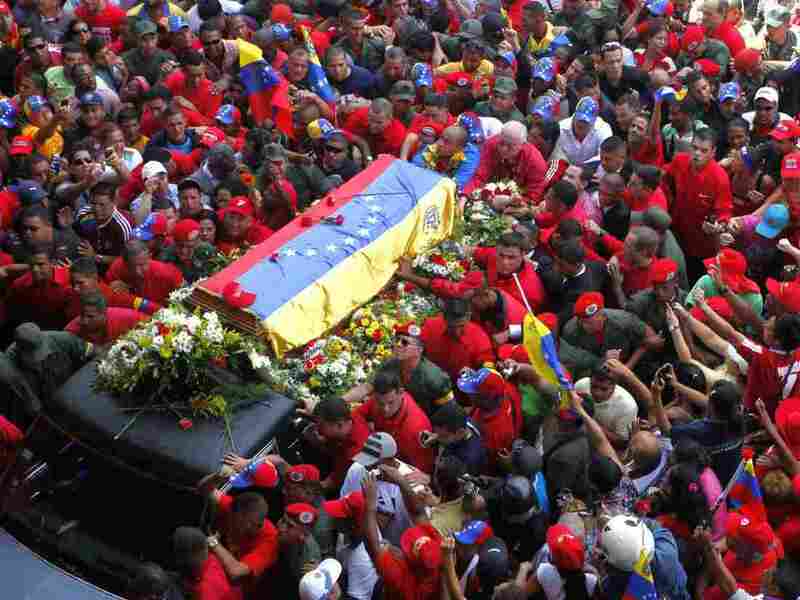 March 6: In Caracas, many Venezuelans crowded the streets to see the coffin of President Hugo Chavez. The decision to embalm the body of Venezuelan President Hugo Chávez so that it could be put on permanent display in the country's Museum of the Revolution was made too late, acting President Nicolas Maduro said Thursday in Caracas. So, The Associated Press reports, it is now highly unlikely the late leader's body will be on view indefinitely — like those of Vladimir Lenin in Russia, Ho Chi Minh in Vietnam and Mao Zedong in China. The 58-year-old Chávez, who had cancer, died on March 5. Two days later, Maduro said the body would be embalmed and put on view. But the body apparently had not been chemically treated within hours of Chávez's and hadn't been kept refrigerated. According to the AP, as of Wednesday it was still on display at a military academy.